"This is the best pork chop marinade I've ever tasted. I starting throwing things together in a bowl and I'm so glad I wrote it down...try this! Flavor is best when pork is grilled." Cut each pork chop from one side through the middle horizontally to within 1/2 inch of the other side. Open the two sides and spread them out like an open book. Whisk olive oil, brown sugar, lemon juice, mustard, garlic, thyme, onion powder, Worcestershire sauce, vinegar, mesquite seasoning, parsley, salt, and pepper together in a bowl and pour into a large resealable plastic bag. Add pork chops, coat with the marinade, squeeze out excess air, and seal the bag. Marinate in the refrigerator, 6 to 8 hours. 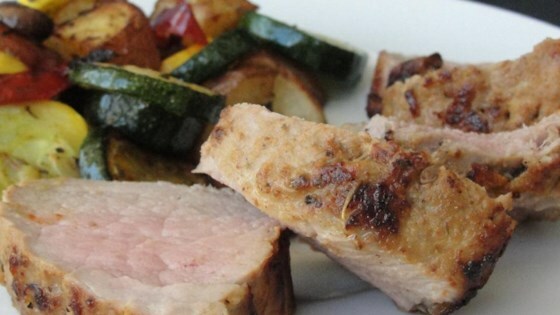 See how to make juicy, flavorful grilled pork chops. Increase amount of marinade if cooking a larger portion. To grill chops, preheat an outdoor grill for medium-high heat and lightly oil the grate. Grill chops until nicely browned on each side and the meat is slightly pink in the center, about 8 minutes per side. An instant-read thermometer inserted into the center of the chop should read 145 degrees F (63 degrees C). Let rest 5 minutes before serving. Very easy to put together! I marinated overnight for about 10 hours. Pork chops were flavorful, moist, and tender. Thanks for the recipe! I did not use mesquite-flavored seasoning. I don't even know what it is. But I used all the other ingredients listed and the chops had a wonderful flavor. This a great marinade for pork. I used two tenderloins instead marinated for 24 hrs yummy. Paired with pasta and salad.